What has been set up is a continuation of the black decade that existed before 2015. This collective has been assembled for an ugly power gamble in the country. We call upon the masses to pay attention to build the broadest center to win their rights says the Leader of the JVP Comrade Anura Dissanayaka. 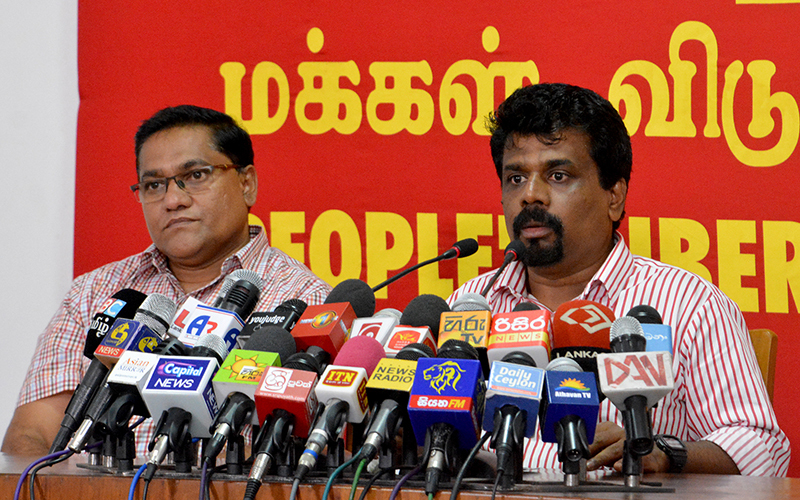 Mr Dissanayaka was speaking at a press conference held at the head office of the JVP at Pelawatta held today (27th). He said, “This press conference is held today to tell the country the viewpoint of the JVP regarding the political changes that were carried out yesterday night and what could happen in the future. We all know that a broad political movement was built for the presidential election in 2015. An immense task was carried out on behalf of this by political parties, civic organizations and citizens. However, the people’s power that was built was totally plundered by Ranil – Maithri ‘joint’ administration and throughout the last 3 ½ years carried out moves against the mandate they received. Ranil Wickremesinghe and Maithripala Sirisena took turns in protecting fraudsters on behalf of their power hunger. The power change in 2015 included the aspiration of the people to build good governance without frauds and corruption. However, Ranil Wickremesinghe and his partners engaged in large-scale frauds completely ignoring the mandate. The mandate included hopes for minimum relief for the masses who were pressurized with economic hardships and wishes for developing education and health services. However, Ranil – Maithri administration continued to oppress the masses, by plundering their assets, burdening them with various kinds of taxes, increasing prices of essential goods daily. The mandate also included protecting resources of the country and building the economy of the country. However, what was done was to destroying national resources and the two of them carried out an administration for 3 ½ years hindering the mandate. The decisive act of this was carried out by President Maithripala Sirisena on the 26th. He threw away the aspirations of the masses who brought him to power and took the hands of the group that was his enemy. What does this political occurrence tell us? If people want they could learn a political lesson from one incident that a thousand books would never teach them. The incidents show the ugly, shameful, conspiratorial and vicious nature of politics in this country. The Ranil – Maithri joint administration is built in 2015, not due to any need of the masses. Ranil wanted Maithri’s support for power. Maithri, throughout the campaign, talked about the violence he confronted with as a minister. As such, what he had then too was a personal power hunger. Also, both of them got together in 2015 to form a ‘joint’ government and increased the number of ministerial posts to protect their power portions. Maithri and Ranil took individuals who were accused of frauds and corruption during Rajapaksa’s ‘black decade’ into their cabinet. It was not on behalf of the masses. The ‘national’ government was formed for their power hunger and not on behalf of the people. They toll the people that the ‘national’ government is formed only for two years. However, this was extended at various times. The pseudo ‘national’ government and extending the term were not the interest of the people. Throughout the past these political cliques though they call themselves political parties, joined, separated, fought with each other and later became friends, not for the benefit of the people. It was for their power interests. It is the ugly, shameful, conspiratorial and vicious nature of this power hunger that was revealed to the people in this country on the 26th. On several occasions, President Maithripala Sirisena had said if he was defeated at the presidential election in 2015 a situation had been created that all his family members would not be living. What did he mean? He told the country that if Mahinda Rajapaksa had won all the members of Sirisena’s family would have been murdered. After saying his on several occasions Sirisena has taken the hand of Mahinda Rajapaksa. Normally, in politics what is criticized are political points. However, various shortcomings were used including Sirisena’s way of speaking, mannerisms by Rajapaksa camp to condemn Maithripala Sirisena. Various words such as ‘hitan’, ‘hutan’, ‘appaya’ were used to condemn Mr Sirisena. However, Sirisena and Rajapaksa have joined together now. Did they join together to develop the country economically or find a solution for the various crises the country is confronted with? They are gathering to form the one that existed before 2015. If so, why was it defeated? The people defeated that regime as it had given the people destructive experienced during the black decade. What has been set up is a continuation of the black decade that existed before 2015. Can Maithripala or Mahinda Rajapaksa present a new politics to the country? Who were around them when Mahinda Rajapaksa was sworn in by Maithripala? The Presidential Commission appointed by President Maithripala Sirisena investigated 34 points. The Commission named Mahinda Rajapaksa as an accused. There are accusations against Weerawansa, Mahinda Yapa. Are others who were around and who were accused by Maithripala Sirisena’s government such as Basil Rajapaksa, Mahindananda Aluthgamage, Rohitha Gunawardene, Johnston Fernando patriots? Why do they gather to one camp? This collective is formed for the ugly power gamble. The Present President in our country is the most bankrupt president. In January 2015 he polled 6.2 million votes. By the 26th he had lost all of them. Also, Mahinda Rajapaksa polled 5.8 votes against Maithripala. Mahinda Rajapaksa too has opposed the mandate given to him. The President wanted to re-establish his power through the ugly, gluttonous, vicious and conspiratorial process. Why did he come out of the government if the country could be developed with Mahinda Rajapaksa? Why does Mahinda contribute to this? Mahinda’s camp was in a very difficult state without power. Several cases against him and his family members are to be heard in November. Also, those who have tasted power and had been mentally and physically broken down wanted power. That’s why they sought matrimony with Maithripala. It has been proved that they would take an ugly, vicious, conspiratorial move on behalf of their need for power. We ask the people to understand that the aspirations of 6.2 mandate of 8th January 2015 do not belong to Maithri or Ranil. Ranil, as well as Maithri, have betrayed the mandate. A new political camp that would be responsible for the mandate and take the country towards a new direction should be built. We, as the JVP, are building such a political front. This power gamble should be stopped. For this, the people should understand what correct politics is. The Information Secretary Comrade Vijitha Herth too was present.